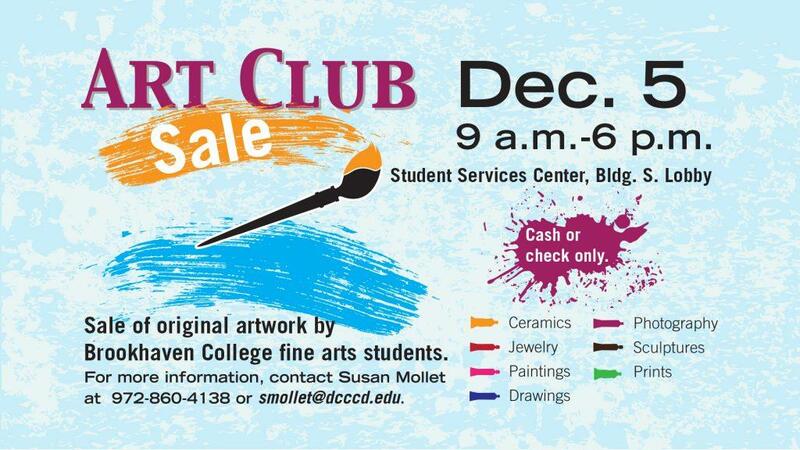 Ceramics, jewelry, paintings, drawing and photography will be among the items available for purchase. Susan Mollet, adjunct ceramics faculty, said the student work that will be available is of fine art quality, most of which was created in the studio classes. Mollet said the sale is the club’s main fundraiser. Of the money the artists make from the sale, 20 percent will go back to the club. Mollet said part of the funds raised will go to charity. Each year, club members chose charity organizations they want to support. This year, the club chose Shared Housing Center, a Dallas-based nonprofit that facilitates affordable housing options for homeless or near homeless individuals. Mollet said organizing the sale was a challenge in the beginning. However, throughout the years, they have gained experience and made the sale more organized. She said a lot of work goes into the preparation of the sale, but club members help carry the weight and lighten the load. Cash and check will be the only forms of payment accepted during the sale. This entry was posted in Arts & Entertainment by Managing Editor. Bookmark the permalink.